The 1970s were a turning point for Matchbox. 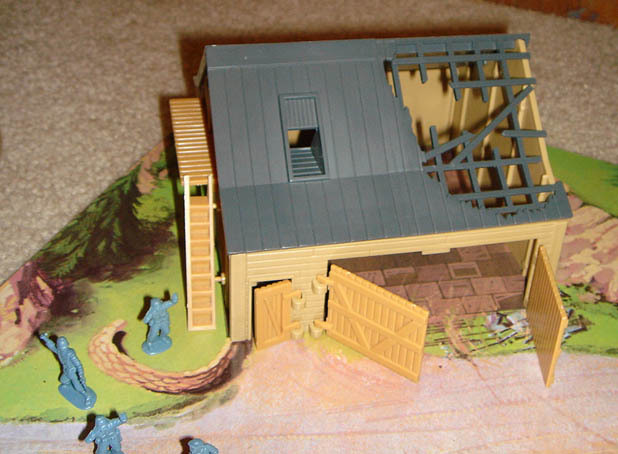 Under Lesney ownership, they began to move into an area that had been Airfix's territory, HO-OO (1:76) scale figures. While little plastic figures of dogs, hunters and others had been included with vehicles since the late 1960s, Matchbox started including soldiers with their die cast vehicles in 1973 with the Stoat armoured car. In 1974, they brought out the Battle Kings sets, most of which included three nylon plastic soldiers with the sturdiest bases I have ever seen on small scale figures. 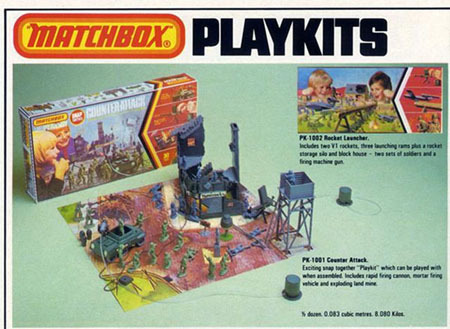 In 1976, Matchbox included 15 of them in the PS-2 "Beach Head Assault" playset. You can still find this set periodically on Ebay or from your better second hand figure retailers. 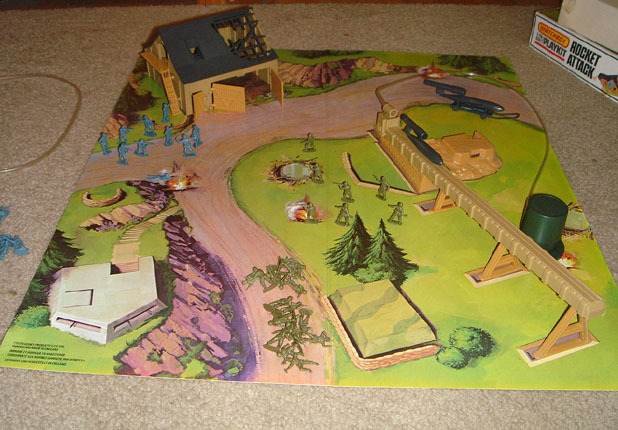 But it is almost impossible to find Matchbox's second such military playset, "Rocket Attack" Playkit number PK-1002. The only catalogue it was featured in was the 1979 one. 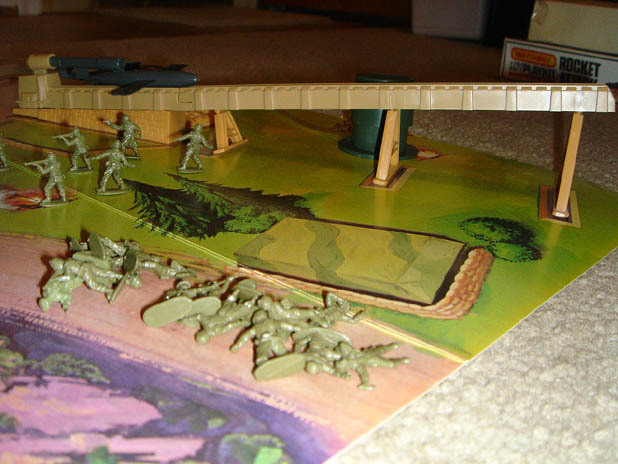 It was a tiny picture compared to the 1/32 Counter Attack playset and the set was even mis-named "Rocket Launcher"! The most notable was a V-1 launch ramp with two V-1 rockets. Matchbox was not satisfied with merely having a static scene...this was a playset. The launch ramp and oversized machinegun each had corresponding air pumps which were attached with clear plastic hoses. 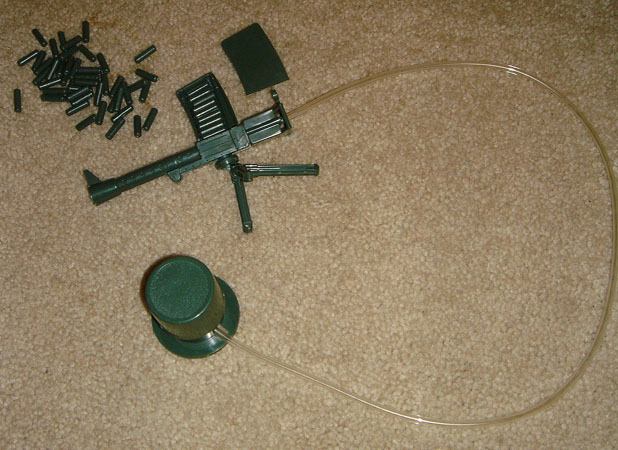 When you loaded the machinegun with plastic bullets and pressed down on the pump, a bullet would get fired. Given a 10-shot magazine, this is a lot of fun to play with (even now). And the V-1 rockets could also launch down the ramp with a similar blast of air. Truly, a fun playset! Unfortunately, this playset didn't sell too well. I have no idea why. Perhaps it was because of the times when it was produced, just as the vicious 1979-82 recession occurred. Or perhaps the prices were too high. Regardless, this is one of those great gems of toy soldier collecting. 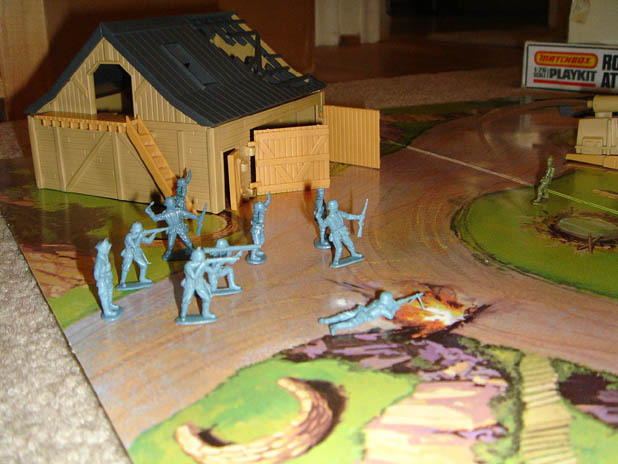 For a review of Victor's first book on plastic figures, "The One Inch Army", click here.